Jakarta. Dedy Rachmanto made his one life-changing decision more than a quarter of a century ago. Feeling disatisfied and unfulfilled working at hotel in Jakarta, he decided to make a go of his real passion: to become a full time clown. Speaking in an interview in North Jakarta, Dedy - now Dedy Delon - said he has always been that funny guy who likes to light up the room with his jokes. "I've always wanted to make people laugh, even back when I was a kid. I never stayed quiet for very long," he said. Dedy grew up in Senen, near a famous market in Central Jakarta. His parents used to take him to a night circus near their home. It was during one of these shows, when Dedy was 9 years old, that he fell in love with circus and clown. Years later, Dedy graduated from nearby Sahid University with a degree in hospitality and started a job at a hotel. Dedy said working in a hotel didn't exactly give him the opportunity to express his "funny side." "I was so stressed when I worked at the hotel. The schedules were tight and I had to act so proper all the time," he said. It was even more frustrating for Dedy since before he went to hospitality school, he had been learning the art of clowning from a clown maestro, Pak Tepong. Dedy learned pantomime and how to do clown acrobats from the old man up until he graduated from high school. Pak Tepong helped him land his first job in the entertainment business as an assistance to the magician legend Adri Manan, from 1991 to 1993. Dedy took this opportunity to learn magic tricks, which came in handy in his later career as a clown. After three years of helping out Adri set up his show, Dedy decided to start performing solo. But he began by going around Sarinah in Central Jakarta to meet people and hand out his name cards. "I went to shopping malls, hotels and restaurants to offer my service. Even though I'm a clown, I always look presentable when I meet people for business. People take you seriously that way. Yes, I'm aware of the irony," the clown said. By the end of 1993, Dedy Nelon was flooded with requests to perform at business gatherings, birthday parties and weddings. "I have never been as convinced in my life as when I made that decision to become a full time clown. And now I love this job, I'm gonna make the best of it," Dedy said. To be a professional clown, you need discipline and practice. Dedy often spends hours just to learn one magic trick. And yet, many people still don't consider clowning as a real occupation. Dedy said he often faces discrimination for being a clown. "When I come to an event, other artists would get their own tents. The service is great and there would be AC inside. I never get any of that, even though I always tell people that clowns are also artists that need to be respected," he said. There were even times when he didn’t get paid. "Some events take a long time to pay up, and often, I ended up with nothing from them." Having been in the clown business for so long, 50-year-old Dedy Delon now wants to share his knowledge to young clowns for free. "I am a true believer in free education. I become what I am today because of people who go out of their own way to educate and train me," he said. A few years ago, Dedy opened a free class for young people who want to learn how to be a clown. Dedy used his own money to rent a studio for his class, which takes place every Tuesday in Kwitang, not far from Senen. But even when it was free, the class was almost always empty. "Young people were more interested in skateboarding and breakdancing. It’s hard to find people who want to be in this profession," he said. But Dedy persevered. He decided to open another class. This time, he rented a small studio at the crowded Mangga Dua Square in North Jakarta. He told store owners in the building to bring their children to the studio. This strategy seems to be working so far, even though the store owners at first were only sending their kids to Dedy's class so they have something to do after school. "I am planning to open a reading corner in this mall too. But as of now, I'm quite happy with the studio," he said. 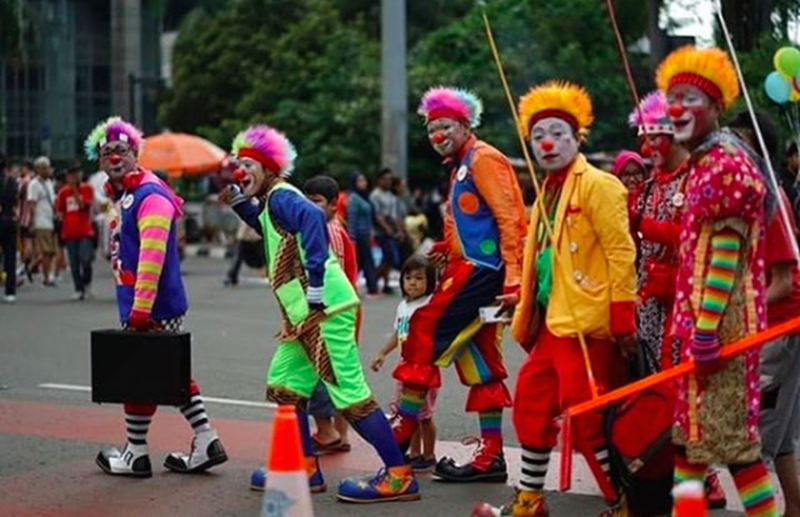 Dedy has also set up his own clown management company, the Clown Enterprise, now managed by his 21-year-old son Deri, who is also a professional clown. Clown Enterprise helms two management companies, Double D and ABI. Dedy has been in the clown business long enough to recall its ups and downs. Business was blooming in 1993, the year he started. He would get bookings for a show within hours of handing out his cards. He would do five to ten gigs every week, each one running for two to three hours. He was laughing all the way to the bank. "That was the peak of my career. I often surprised myself at how quick I got bookings," Dedy said. Dedy said he was smarter than other clowns, who usually target smaller birthday parties. Dedy would contact event organizers, who would book him better paying jobs. "Working with an EO gets me more money. A birthday party usually lasts only one to two hours. EOs can give me three- to five-hour gigs," he said. In 2002, the gigs suddenly dried up. He barely received calls. His busy schedules were quickly replaced with efforts to make ends meet for his family. "I was quite depressed at that time, but during hardship, I found my true purpose," Dedy said. "A professional clown makes people happy and makes money while doing it. I've worked harder to earn my income, but now, I also give to those who need it." 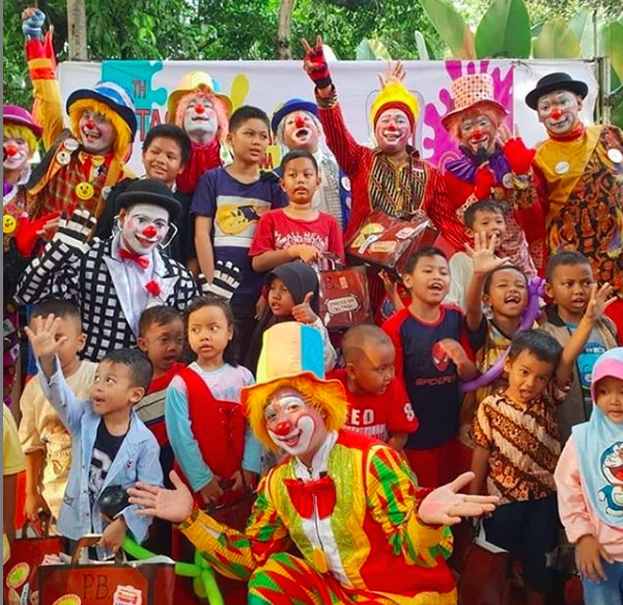 In Februar last year, Dedy and some of his clown friends established a care community known as ABI, or Aku Badut Indonesia (I Am an Indonesian Clown). ABI's main focus is to raise money for charities, especially for disaster victims and cancer patients, through several programs such as Gerakan Anti Mubazir (Anti-Waste Campaign) or by making donations to mobile libraries and organizing free birthday celebrations. "Not everyone can become a member of ABI because our focus is social work. If you are looking to make money, this is not for you," Dedy said. Every weekend on car free day, ABI will run around Jalan Thamrin in Central Jakarta to raise funds for disaster victims, orphans and kids with cancer across Indonesia. Last month, when a tsunami hit Banten, ABI visited a shelter in Karabohong village to entertain the young victims there. Dedy and his friends are also frequent entertainers at the halfway house Rumah Singgah Amaryllis Kirana in Tangerang, Banten. "We don’t always give a huge amount of money, but with our skills we help these kids get their smiles back," Dedy said. ABI is also planning a tour across Indonesia to hold free workshops and training. "We've got a lot of things to do. In the mean time, we are going to open a store in Mangga Dua Square where clowns can buy their accessories for cheap." "At the end of the day, clowning is all about helping other people," Dedy said.